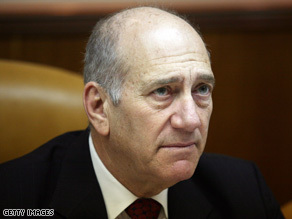 Prime Minister Ehud Olmert: "The state of Israel takes these attacks very seriously"
JERUSALEM (CNN) -- A "huge disaster" was averted when a car bomb, set to go off outside a shopping mall, was disabled before it exploded, Israeli Prime Minister Ehud Olmert said Sunday. Israeli Prime Minister Ehud Olmert said Sunday at a Cabinet meeting that it was "a miracle" no one was hurt. The incident happened Saturday night in Haifa, police said Sunday. The car was parked outside, adjacent to the mall, and was loaded with dozens of pounds of explosives, said police spokesman Mickey Rosenfeld. "After a small explosive device went off in a parked car, policemen and bomb sappers arrived at the scene and discovered the car," he said. "... The bomb disposal experts disabled the rest of the explosives and are investigating the incident." Speaking at the weekly meeting of the Israeli Cabinet, Olmert said, "As far as the state of Israel is concerned, this was purely a terrorist attack. Only through the awareness of citizens and the quick actions of the Israeli police did a miracle occur and this terrorist attack ended without casualties." The Lev Hamifratz Mall was crowded with hundreds of people at the time, Olmert said. "Naturally, the state of Israel takes these attacks very seriously," he said. "The security forces are already investigating this incident in order to uncover the perpetrators and bring about their capture. Initial findings indicate that we are talking about a very serious terrorist infrastructure, which operated with great sophistication in order to perpetrate a large-scale attack with multiple casualties." He said the upcoming days leading to Passover, which begins the evening of April 8, "are, by their very nature, days in which terrorist organizations will try more than ever to disrupt life in Israel. The security forces will be on their highest alert in order to prevent these attacks." CNN's Shira Medding contributed to this report.